The essence of the approach followed by iServe is the use of import mechanisms for a wide range of existing service description formalisms to automatically transform and expose service descriptions as Linked Data. Once transformed, the resulting service descriptions, which we refer to as Linked Services, are expressed in terms of a simple RDFS model, Minimal Service Model (MSM), which essentially captures the intersection of existing service description formalisms so as to smooth away the heterogeneity of services and SWS formalisms. In a nutshell, MSM is a simple RDF(S) integration ontology based on the principle of minimal ontological commitment; it captures the maximum common denominator between existing conceptual models for services. Thus, MSM does not aim to be yet another service model to bring further heterogeneity to the services landscape; it is instead an integration model at the intersection of existing formalisms, able to capture the core semantics of both Web services and Web APIs in a common model, homogeneously supporting publication and discovery. Minimal Service Model, denoted by the msm namespace in the Figure below, defines msm:Services which have a number of msm:Operations. Operations in turn have input, output and fault msm:MessageContent descriptions. msm:MessageContent may be composed of mandatory or optional msm:MessageParts. The msm:isGroundedIn property enables to capture the grounding of elements of service descriptions defined by other models, such as WSDL, SWAGGER, WSMO and OWL-S. 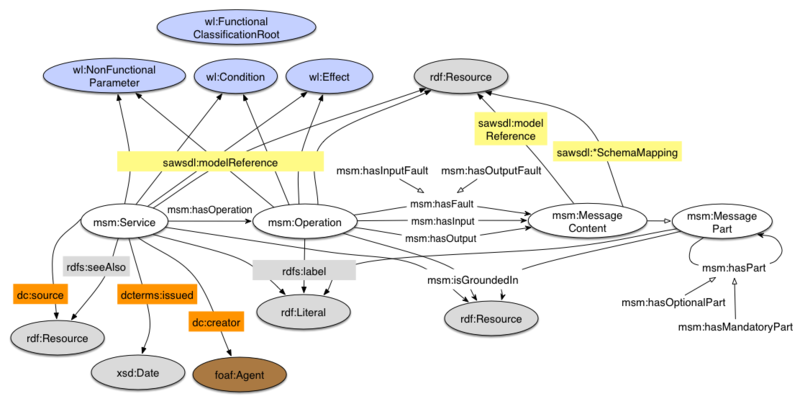 In other terms, this property allows us to bind any other kind of structured service description to MSM elements, with the aim to make MSM an agnostic model for semantic annotation, leaving the technical invocation details to other specifications. MSM-NFP, which provides useful Non-Functional Properties (NFPs) of services to support Web developers, such as service provider information and social media channels. The SAWSDL vocabulary provides three properties, namely sawsdl:modelReference, sawsdl:liftingSchemaMapping and sawsdl:loweringSchemaMapping. These properties enable one to link existing descriptions to semantic models (modelReference) as to scripts able to transform diverse serialisations into their semantic counter part and vice versa. The WSMO-Lite vocabulary completes MSM by providing classes for describing the main service semantics and by supplying type information to the generic model references. In particular, WSMO-Lite captures non-functional semantics through the concept of wl:NonfunctionalParameter, and functional semantics via the concepts wl:Condition, wl:Effect, and wl:FunctionalClassificationRoot. 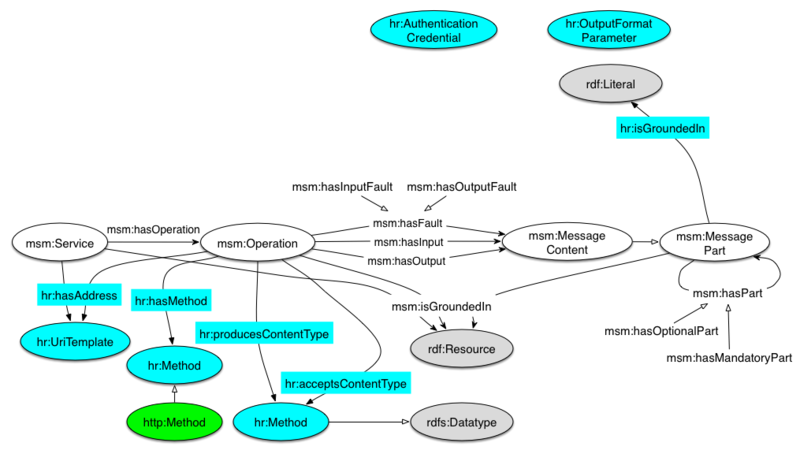 The current version of hRESTS (v1.2) exploits terms from the HTTP RDF vocabulary to define the HTTP methods used by operations. MSM-WSDL provides one simple property, msm-wsml:isGroundedIn, which enables us to capture the grounding of elements of a service description into the actual WSDL element that defines it. This property essentially provides us back and forth navigation from MSM service descriptions into WSDL files as necessary to carry out invocation for example. For the current MSM-WSDL version (v0.2), the WSDL element should be specified according to a WSDL 1.1 or 2.0 IRI-references syntax defined by a XPointer expression. The grounding of Swagger description is defined by an extension vocabulary, called MSM-Swagger. This ontology provides grounding to Swagger descriptions through the msm-swagger:isGroundedIn property. Swagger elements, which are defined as JSON portion, are specified through JSONPath expressions. MSM-NFP is a MSM extension that aims to support the description of basic NFPs. The current version of MSM-NFP (v0.2) focuses on the definition of properties which provide relevant information for developers which integrate services in their own applications. To inform developers of the usage of a service, msm-nfp:hasTotalMashups and msm-nfp:hasRecentMashups properties has been defined. The two properties respectively define the total number and the recent amount of mashups in which a Web API is a component. A Web API can have a forum to support developer issues. This information can be specified through the msm-nfp:hasForum property, which has the sioc:Forum class, from the SIOC vocabulary, as range. MSM-NFP specifies also a measurement of the forum vitality, as average of daily users that post messages, through the msm-nfp:hasVitality. This measure can be useful for developers to figure out the promptness of the forum community to support users issues. Measures of service provider popularity can be specified by the msm-nfp:hasPopularity property as a numeric value. The schema:Organization and schema:Person classes, defined by the Schema.org vocabulary, are the domain of the msm-nfp:hasPopularity property. These two classes allow us to define a service provider which is associated with a service through the schema:provider property. A provider, defined as a foaf:Agent, can have a Twitter account as a means to provide updates about his Web APIs. A Twitter account is an instance of the msm-nfp:TwitterAccount class (subclass of foaf:OnlineAccount) which is a associated to a provider by the msm-nfp:hasTwitterAccount property (subproperty of foaf:account). Both DC Terms and FOAF provide general support to capture metadata such as a textual description, the creator of a service description, etc. SIOC vocabulary provides the main concepts and properties required to describe information from online communities, such as wikis, weblogs and forums. Finally, Schema.org is a collection of terms that webmasters can use to markup their pages, which is introduced by Bing, Google and Yahoo! to improve the display of search engine results. We provide herein information about versions, namespaces, and links to the vocabularies used for your reference. Copyright © 2015 Knowledge Media Institute - The Open University. All Rights Reserved.